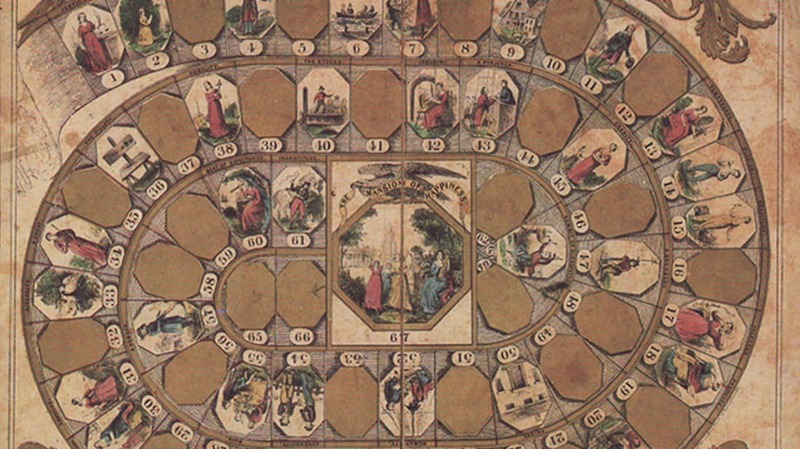 In this 1790 game, players moved through different stages of life, from infancy onward. Players moved backward or forward on the game board according to the moral character of the square they landed on. Landing on the “drunkard” square sent a player back, while landing on “The Assiduous Youth” sent a player forward. Landing on a career like “The Romance Writer” or “The Dramatist,” per 18th century social mores, sent players backward. In the early 1800s, this was the most popular board game in Britain. It centered around ideas of vice and virtue, as players attempted to reach the “mansion,” a heavenly reward for the pious. Think of it as Chutes and Ladders meets Sunday school. First published in 1815, players raced across European cities from Oporto, Portugal to London by spinning a teetotum. Per the rule book, landing on a capital city garnered a player a bonus spin, and the first one to land exactly on the London square won the game. Chaupar, a gambling board game, has been played in India for millennia and was especially popular in royal courts. Often using a cross-shaped cloth board, it’s played with three dice and 16 pieces. The modern game Parcheesi is an adaptation of a variant of chaupar called pachisi. In this 1835 board game, players spun a “circle of chance” that dictated whether they moved forward, backward, left, or right, journeying through a village and up to a castle on a hill, encountering impassible waterways, robberies, and other obstacles on the way. In Tori Shogi, a Japanese variant of chess, all the pieces are types of birds, including phoenixes, cranes, and swallows. The game was invented in 1799 [PDF]. This two-player game was invented in the 1880s by an American surgeon who named it after an ancient Greek word for “jump.” Halma declined in popularity in the 1900s with the introduction of Chinese checkers, a game with similar rules that could accommodate more players. The rulebook for this whimsical zoo game hasn’t survived, but it seems to have involved numbered animals, and it came with great artwork. Maybe it was a paint-by-numbers sort of thing? This game, whose name in English means “assault,” appeared in Germany as early as 1803. One corner of the board was the fortress, and it had to be defended by one of the players against attack from the other. Most of the pieces were designated foot soldiers, while just two pieces were officers that could move more freely across the board. The goal was to capture the opponent’s pieces and win the battle. The McLoughlin Brothers publishing house released this game in 1886. By moving pieces around a board, players competed to see who would become the president of a telegraph company. This two-person game was designed to teach children the geography of England, Scotland, and Wales. Players placed locomotives at a certain start point and rolled dice to determine how far they traveled. A French board game that roughly translates to “new game of marriage” (though that last word also means hymen), its artwork appears on this porcelain tray from around 1725. The squares map the trajectory of a romantic relationship, with references to Ovid, the Odyssey, and other classical texts. The game of astronomical tables—or seven-sided backgammon—was included in the Book of Games, an encyclopedia commissioned by Alfonso X of Spain in the 13th century. The seven sides were for the seven planets then known to astronomers (the moon and the sun were included, but Uranus and Neptune were not). The medieval book called the game “very noble and very strenuous and very elegant, and of great intellect for the wise,” according to one translation. Board game legend Milton Bradley debuted the Checkered Game of Life during the Civil War. The game begins with infancy and ends with old age, with stops for "crime," "industry," "politics,” and “Cupid” along the way. Bradley's first game eventually morphed into the Life board game we play today.